When you create a Wild Apricot account, you are provided with a free website address. If you already have your own custom domain address, you can use your custom domain name in place of your free Wild Apricot address. If you are using Network Solutions as your domain registrar, follow these instructions to set up your Network Solutions account and Wild Apricot account to use your custom domain as the address for your Wild Apricot site. Log into your Network Solutions account and click Manage Account. 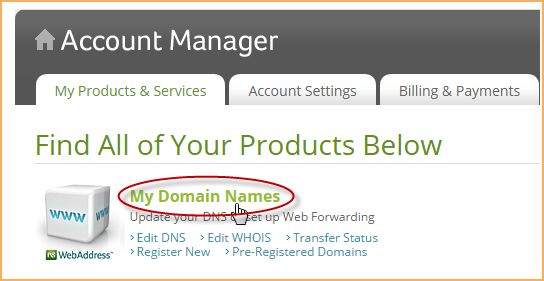 Within Account Manager, click My Domain Names. Click Change Where Domain Points for the domain name you want to manage. Use the directions that follow to set up the required records. Click the Edit A Records button. 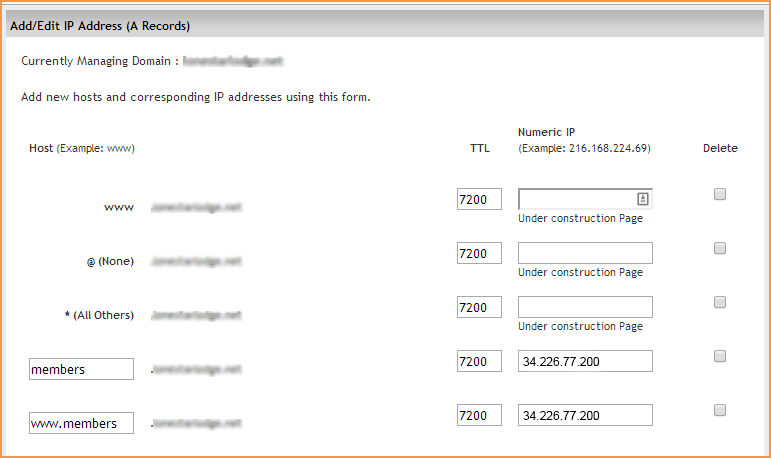 Set the Numeric IP for @ (none) and * (All Others) to 34.226.77.200. Leave the A-record www box empty. If you would like to use a sub-domain (e.g. members.myorg.com) instead of a full domain (e.g. myorg.com), then type both the www and regular versions of the sub-domain name in the host field, and set its IP to 34.226.77.200. Click Continue. 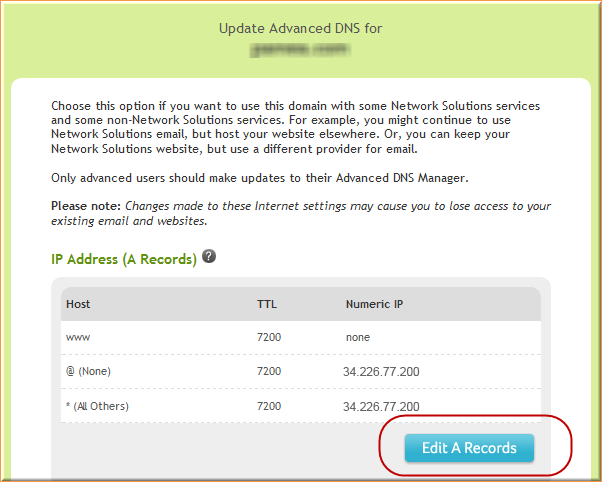 If prompted to confirm you DNS changes, click Save Changes. Click Return to Advanced DNS Summary. For a sub-domain skip this step. Click the Edit CNAME Records button. 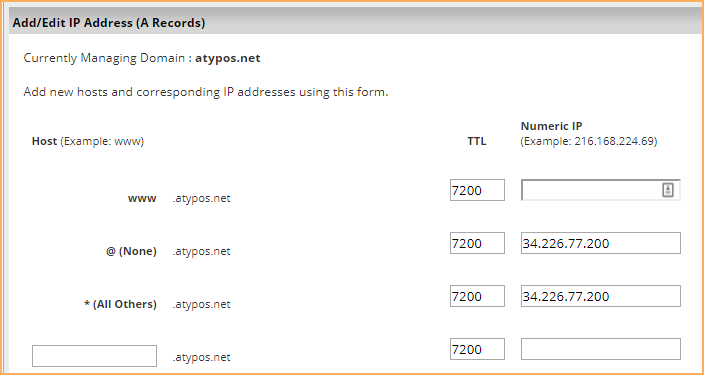 Enter www in the Alias field and sites.wildapricot.org in the Other Host field, then click the radio button beside the Other Host field. 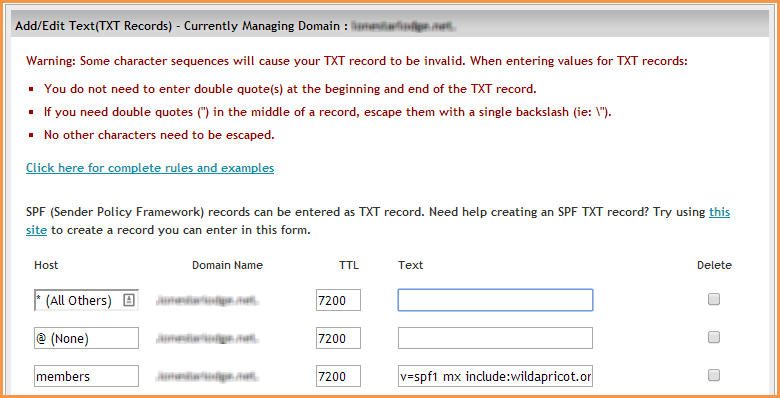 Within the next blank CNAME record, set the Alias to default._domainkey. In the Other Host field, enter dkim.wildapricot.org. Click the Edit TXT Records button. 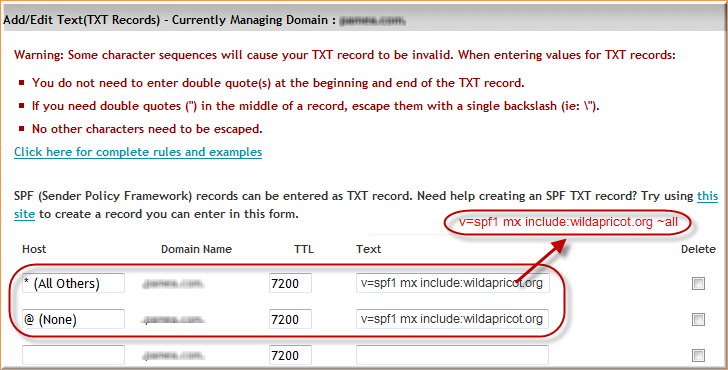 In the Text field for both the * (All Others) and @ (None) hosts, enter v=spf1 mx include:wildapricot.org ~all. Log into your Wild Apricot account as a full administrator. Click the Settings menu, then click Domain name under Site settings. From the Domain name management screen﻿ that appears, click the Add custom domain name button. Enter your custom domain name without the www in the Enter domain name field then click Save. Entries will be added for both the www and regular versions of your domain names. If your custom domain was properly set up, then the entries will be marked as Correct. If the domain name is marked as Invalid, you need to check your DNS settings again. If your custom domain is marked as Correct, choose the www or regular version of your custom domain to be your primary domain name by clicking Set as primary beside that domain. After setting a custom domain as your primary domain, you should review your traffic encryption settings.